i know it’s been a week, but how was your memorial day weekend? i went home (though this weekend was no different from the others; i’ve had 4 day weekends all of this quarter, but don’t worry, i’ll pay for it next quarter), and it was very chill. there were no churn ice cream pops that didn’t want to come out of the popsicle molds: the popsicle sticks didn’t want to stick to the rest of the ice cream. so those are currently lounging around in the freezer at home. there were smoothie bowls, which took extensive research. it’s hard to see them in this picture, but those frosty blueberries didn’t frost themselves, you know. there was white chocolate and strawberry cake, which i’ll make again soon to streamline the process (it took me 3-4 hours…) before posting here. there were also aesthetic toasts, which will go up on my instagram someday. and man, it felt like summer with all the couch lounging and aesthetic food making and dropping madeleine pans at 1am (my parents were thrilled with that last one). and summer makes me think of candy-sweet fruit and mountains of salads, which kind of leads into slaws. so, how about a cabbage slaw? 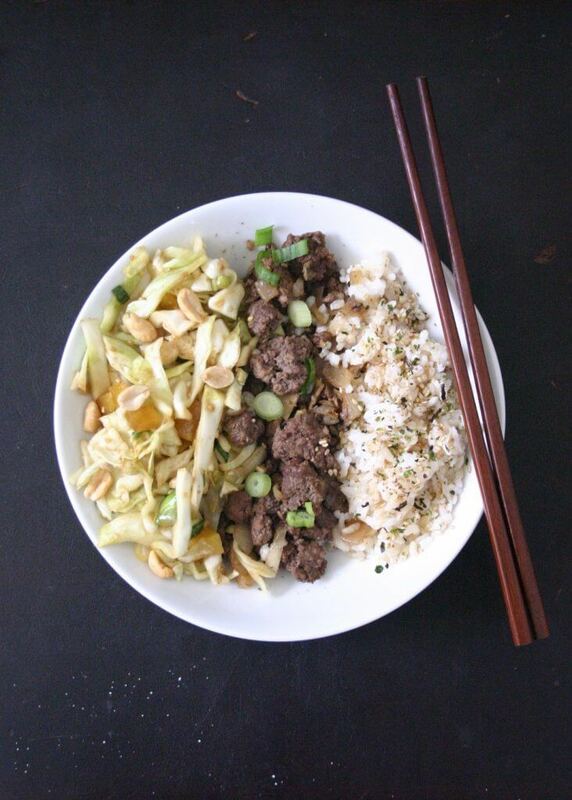 placed into these beef rice bowls with sesame cabbage slaw? these beef rice bowls with sesame cabbage slaw are perfect when you want a heap of veggies, or want to munch through some crunchy things. the cabbage adds a fresh crunch, the takuan (aka pickled radish) adds a pickly crunch, and the peanuts add a nutty crunch. i can also imagine how good this slaw would be with sauteed mushrooms, or pickled red onions, or roasted cashews, or orange segments, or etc etc. i really like vegetables and crave them, but even if you don’t, we can pretend that we’re both lusting after this cabbage slaw. and if pretending is too much for you to bear, might i suggest transforming this into lettuce wraps? take the beef and spoon it onto lettuce leaves, maybe with a hoisin-based dressing, maybe pickled carrot / daikon / cucumber, maybe some mint and basil leaves. 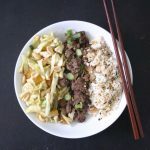 These beef rice bowls with sesame cabbage slaw are perfect for a quick weeknight dinner that pairs tender beef, chewy rice and crunchy slaw. In a medium pan over medium-high heat, saute the beef until browned and cooked through, breaking it up into small bits with a spatula or wooden spoon. Add the onion, and saute until translucent. Add the garlic and ginger, and saute until fragrant. Add everything else, and mix until combined. For the sesame cabbage slaw: Combine everything but the peanuts. Let sit for at least 1 hour, or until the cabbage is slightly softened. Longer is better here, and I'd recommend overnight if you have the time. Serve at room temperature, sprinkled with peanuts. Adapted from Mary Kate and Nate Tate via Epicurious, January 2012. You could definitely sub in crumbled firm tofu, ground chicken, ground turkey, etc for the beef! You'll need to use some oil when you saute the protein. Wonderful looking recipe! We have lots of chicken, not beef for some reason. This is added to the list of meals to try this week. Thanks! chicken would be just as tasty in this (: thanks, paul! oof, i’m still cringing about that pan dropping. it was loud even to my awake ears. Yum. This looks excellent. 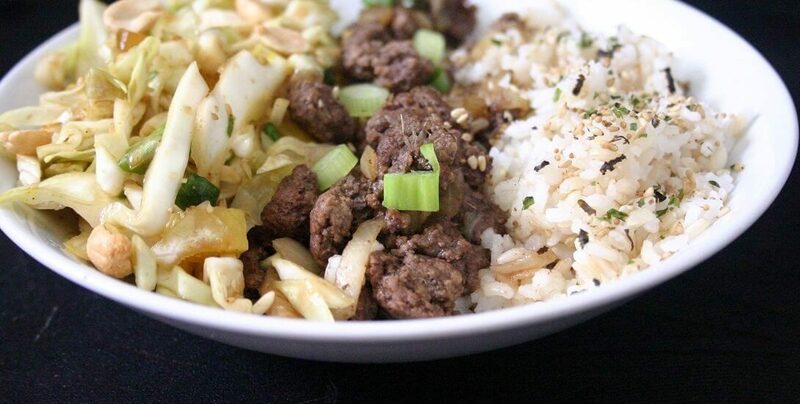 I love cabbage so much I have been eating it at every meal recently but this beef rice bowl looks insanely good. i love cabbage too! i feel like it’s underrated, but it’s so sweet and i love that it can be perfect cozy food if you braise/roast/etc it or summer food if you don’t. Will definitely try your slaw recipe sometime soon as we eat a lot of salads in summer. I’m a sucker for cabbage, and I’m pretty good at cooking it layering flavors while still keeping it crunchy and delicious. Now beef, on the other hand, I’m not so good at making. Wait, you used ground beef, I can totally handle that. Loving the addition of roasted peanuts adds a nice pop of texture and crunch. 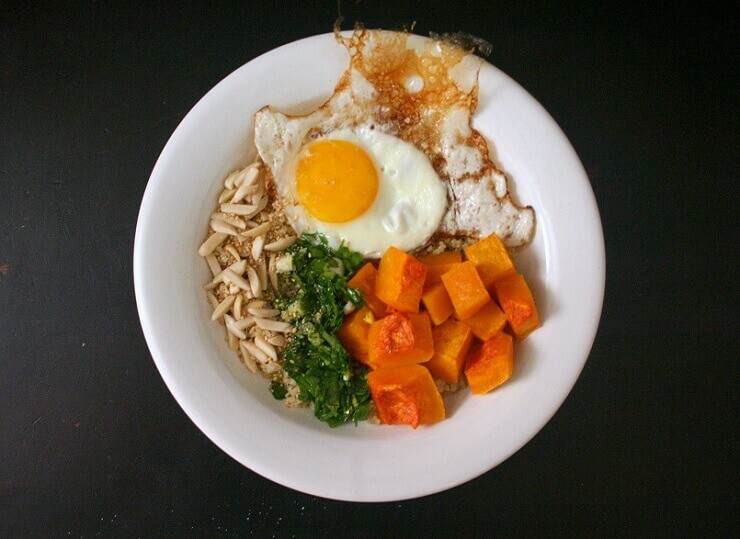 Who doesn’t love a hearty and balanced BOWL! probably people who are over bowl food. but thanks, gigi! It looks and sounds wonderful! I would totally devour that in no time!! This is total comfort food for me and a complete meal in a bowl. I love a good crunchy slaw and it (along with the beef and rice) sounds so savoury and flavourful! Ohhh the cabbage slaw sounds really good. I normally do not have beef at home – I don’t really like it – but this week I have it! I think I’m gonna try this, I also have a red cabbage and always have sesame seeds, so I’m good to go!! ooh red cabbage would be pretty here (: my green cabbage here was more pastel-y than a rich green, oh well. It’s not summer vacation until a madeleine pan gets dropped at 1am…so welcome to summer!! 🙂 Also, I love the beef rice bowl idea. That cabbage slaw sounds excellent, and I’m always down for a good beef dish. Sign me up for this one…just not at 1am. Haha! it’s not quite summer yet (less than 5 days to go though!! ), but it was a nice interlude (; i can’t say that i’d be down for this at 1am either lol. That’s too bad that the pops didn’t come out! What a bummer! Oh well…perhaps you can thaw them out a bit and pour them into a bowl for another smoothie bowl?? Love the idea of using this with lettuce wraps – one of my favourite things ever! Healthy, light and perfect for summer eats! Awesome combination of ingredients, Heather! Keep up the great work! Loving the look of this meal! I don;t get enough red meat into my diet so this will help, thanks. i definitely don’t get enough red meat in either (i don’t love the feel of touching raw meat lol). thanks, rich! Love the slaw recipe for this!!! We are making flank steaks with a similar beef marinade this week and this slaw looks like the perfect accompaniment! YUM! DANG this looks good. I love cabbage anything so this is looking mighty fine to me right about now. agree that cabbage anything is great!! cabbage is underrated. I would devour this within seconds! Tip about ensuring that the wooden sticks adhere to the popsicle- soak the wooden stick in some warm water before inserting them in the mold. 🙂 Hope that helps next time! I laughed at the thought of you dropping your madeline pan at 1am. So funny! Love this slaw!! I finally added you to IG. Why did it take me so long!? Too much going on….cheers!! 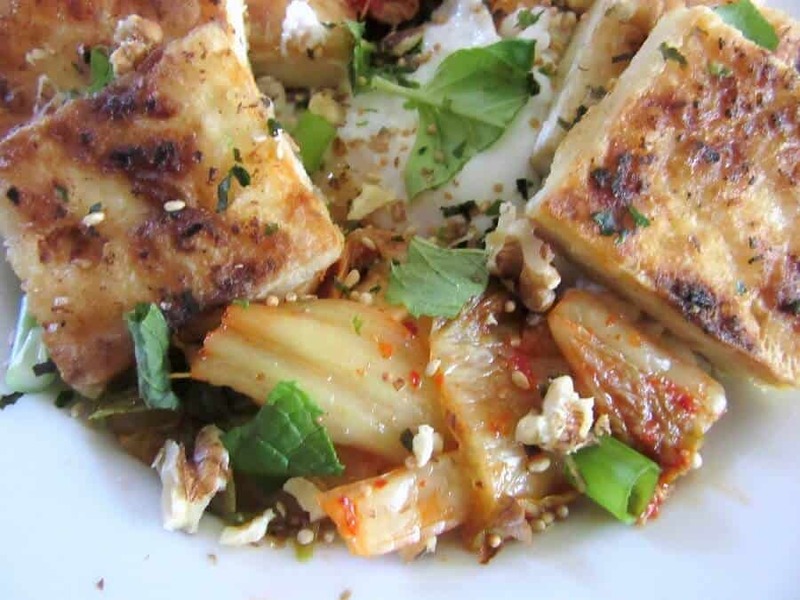 Like how simple and summer appropriate this dish is.. Like the takuan addition to the slaw. I need to find it or maybe just make some pickled raddish at home. you can find takuan at a chinese or japanese or korean supermarket! it’s pretty easy to make at home, too, and you can either use turmeric for the coloring, or just forgo the color altogether. happy takuan eating! I need this in my life right now. I haven’t been very good at eating my veggies lately and to be honest, besides salads and plopping dressing on it I haven’t really been inspired (either that or I am not a fan of eating veg) but your slaw looks so amazing. You put peanuts! That crunch from the peanuts and cabbage sounds amazing! hope you get inspired soon! i think all the awesome produce out right now makes it easier to get in your veggies (: but i’ve also been on a veggie kick these past days because i ate a lot of delicious but junky food last week, oops. and yes, the peanuts make it that much tastier! This bowl looks so good I could just inhale it right now! Can you send me some? I love the balance of sweet/savory/spicy – all of my favorite ingredients. The slaw sounds especially enticing! Thanks! not sure it’d still be good if i mailed it to you (; and yes, i love that balance, too! pork or chicken definitely works too (: both options would be a bit more work, but i’m sure it’d be delicious!